The spring/summer FASE Newsletter is out! Read the current and previous issues here. Registration for FASE Basic workshop will be opened soon! The call for FASE certification which will take place after the Basic course will be announced as well! The deadline for applications will be end of May. 2018 FASE BASIC COURSE in Forensic Anthropology will be held in Marseilles, France. Save the date and join us in September 2018! Basic course will be followed by FASE One-day SYMPOSIUM. More information will be posted on FASE web page and on our FB page (FASE – Forensic Anthropology Society of Europe). FASE President Professor Cristina Cattaneo receives the Adelaide Medal 2017. 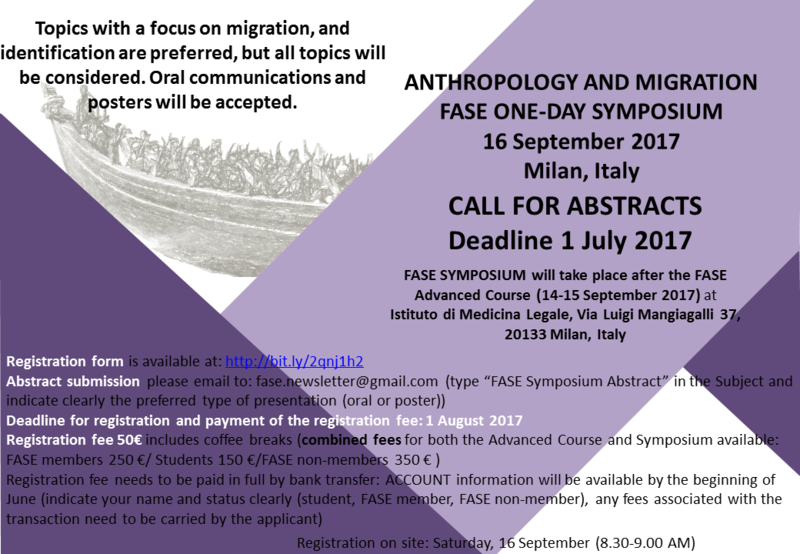 Forensic Anthropology Society of Europe (FASE) organises the Advanced Course – Anthropology and Migration, on September 14th and 15th in Milan, Italy. The Advanced Course is a combination of lectures delivered by renowned speakers and practical exercises simulating real-life scenarios related to migration fatalities, using human remains in different stages of preservation. The practicals will include collection of postmortem data, which will then be discussed and matched with antemortem information provided in a role-play setting. The one-day Symposium provides the opportunity to share your research in the form of oral or poster presentations. The abstracts will be published in the La Revue de Médecine Légale! More information about the event and application can be found in section Activities/FASE events. Do your abstracts need a few finishing touches? A great opportunity to publish all abstract from the Symposium in the La Revue de Médecine Légale! SUMMER 2017 NEWSLETTER has been issued! – read here. CALL FOR ABSTRACTS — ONE-DAY Symposium — Deadline for abstract submission is 1st July 2017. DEADLINE FOR REGISTRATION EXTENDED TO 15th AUGUST 2017. 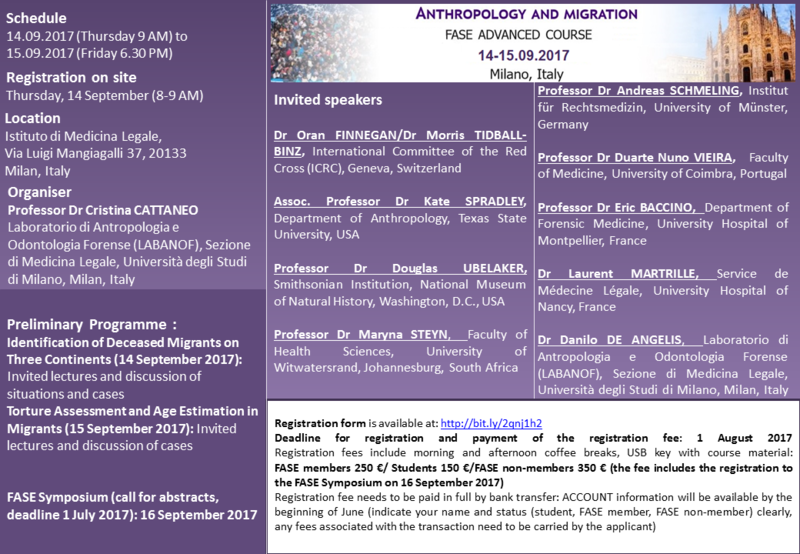 Information about the registration, program and speakers of FASE ADVANCED COURSE in Milan. DEADLINE FOR REGISTRATION EXTENDED TO 15th AUGUST 2017. Information about the registration, program and speakers of FASE ADVANCED COURSE AND 1 DAY SYMPOSIUM can be find online here. FASE CERTIFICATION 2017 will be taking place during this event. More information about fee and application can be found here. -Approach to Forensic Radiology. The situation in different Forensic Institutes around the world. -Post Mortem Interval and Bio-Medical Sciences. All colleagues under 35 years of age who are interested in participating in one of the projects should contact referents no later than 31st of May 2017. New events can be found in section FA in Europe/Events. Great achievements for our President and Vice-President! Professor Cristina Cattaneo has assumed the role of the Editor-in-Chief of Forensic Science International and Professor Ann Ross the role of the Associate Editor of the Journal of Forensic Sciences. More information about fee and application can be found here.